Not all warriors on the medieval field of battle where knights clad in plate armor. Some, like the foot soldiers, used something more closely related to this Riveted Leather Brigandine Armor or coat of plates. This recreation is crafted entirely from fine leather, with a stitched interior and exterior shell. Set within the leather are steel plates, which are then riveted into place, with the rivets being visible on the exterior shell. The armor features wide arm openings, to ensure a good range of movement, as well as buckled straps on the sides and shoulders, for securing the armor in place. It extends just slightly past the waist as well. It is offered in one size, but that size is a generous one that fits most with ease. This armor was improved in the 15th century, being altered to resemble a contemporary doublet. 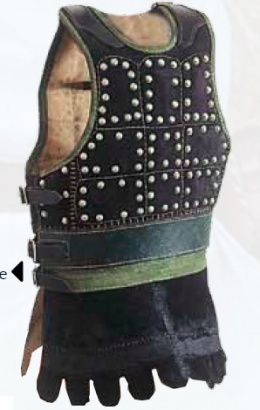 This version of the coat of plates, studded with rivets, was known as a brigandine. The name is derived from "brigand," the name for a common soldier, many of whom would become bandits to survive after the war ended. The coat or Jack of plates remained in use until the end of the 16th century. It was identical to contemporary brigandines although the metal plates were sewn in place rather than riveted. Jacks were often made from recycled pieces of older plate armor, including damaged brigandines and cuirasses cut into small squares. Although the coat of plates was obsolete by the time of the English Civil War many were taken to the New World by the Pilgrim Fathers as they provided excellent protection from Indian arrows; one dating back to 1607 was recently found at Jamestown. This page was last modified on 12 December 2013, at 19:52.